The following text was contributed by the Government of Indonesia. Since 1998, the political reformation “Reformasi” has unleashed exponential public demand for transparency, accountability, and better government. With democratic institutions gradually expanding and the Public Information Disclosure Law having been formally enacted in 2008, openness in Indonesia has been gaining momentum in tandem with the country’s democratic consolidation. In accordance with these facts, the Government of Indonesia is convinced that openness is a basic necessity for a modern government, and a key to unlock Indonesia’s potential in the economy and public service sector, as well as driving an increase in innovation. As such, in 2011 Indonesia did not hesitate to participate in OGP, first as a co-founder and member, and then later as co-chair from 2012 – 2014. Launched by the Vice President Boediono in 2012, Open Government Indonesia (OGI) has been leading and coordinating the implementation of Indonesia’s commitment on the national and sub-national level. Development of the national action plan is overseen by the OGI's core team, which consists of several representatives of ministries/agencies and Civil Society Organizations (CSO), and facilitated by the OGI Secretariat. The Independent Reporting Mechanism (IRM) in 2013 has acknowledged that public participation has increased through OGI's actions, but further recommended to deepen the action plans on the framework to implement transparency and accountability. Taking that the IRM= recommendations in mind, the 2013 action plan focuses on three groups of activities: improvements on public services prone to illegal levies, investment and business services prone to corruption, and the Open Government infrastructure. Enlarging OGP foothold in the Asia Pacific region. Among the many innovative OGI initiatives, there are two streams that have resonated extensively with the public; Public innovation competition and improvements in public service. Three public competitions were held: OGI Competition where 62 public services competed in improving their public services quality, Model OGP – the world’s first youth competition on global openness, and SOLUSIMU – a crowdsourcing national contest to involve citizen in initiating solutions for better public services and public policies. Along with the public service improvements area, OGI has introduced Satu Layanan portal, which now contains 300 models of citizens’ services and LAPOR – a crowdsourcing platform for complaint-handling, and other transparency-focused activities in sub-national levels. One of the key outreach program initiated was the OGP Asia Pacific Regional Conference in 2014 that successfully attracted more than 500 participants from 51 countries. Improving the quality of openness in common public interest areas. The action plan includes new ideas for government solutions as endorsed by citizen through SOLUSIMU competition and covers 23 government institutions as implementers of the action plan. 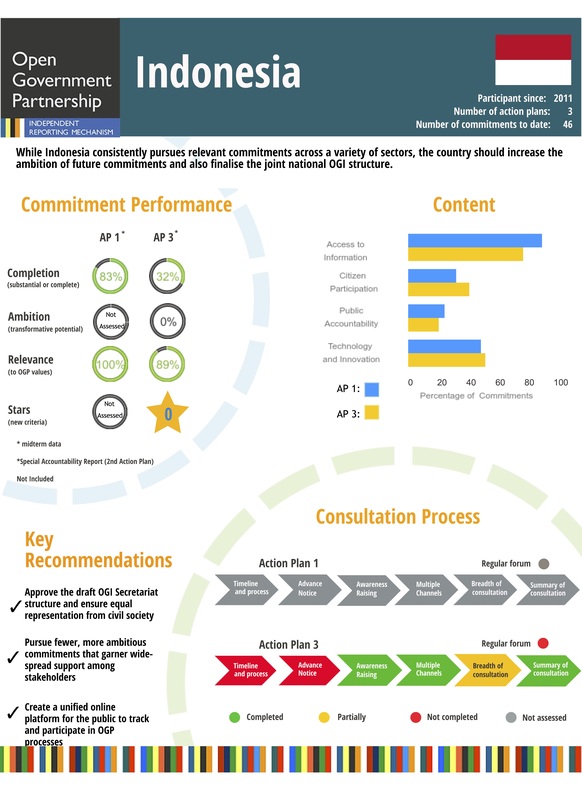 The Indonesian government continues to work intensively alongside civil society, private sectors, and youth to carry out and monitor the implementation of these action plans while promoting and sharing the importance and benefits of open government throughout the Asia Pacific region. To download the PDF of the flyer, click here.